'Remembering The Beatles': A Look Back At Pop's Most Influential Band . Beatles Radio: The Beatles, Solos, Covers, Birthdays, News The Fab 4 and More! The Beatles will never go out of style! The saga of the beloved band is mythical and significant as ever, even 48 years since their heartbreaking split. 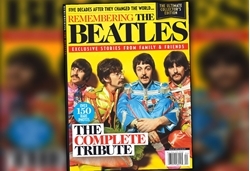 Loyal fans may claim they know everything about icons John Lennon, Paul McCartney, George Harrison and Ringo Starr, but will be surprised and delighted to find amazing first-person stories, little-known facts, and revealing photos inside the special collector’s issue about the band’s life and legacy. Relive the wild magic of their early days playing in Liverpool and Hamburg as well as the love-filed epidemic that their meaningful, catchy tunes caused on young music lovers everywhere. Go behind the scenes for the creation of The Beatles’ brilliant, groundbreaking songs and learn the real reason McCartney got arrested. Check out the new special and get an inside scoop on Pete Best’s firing, plus find out how Lennon’s wife Cynthia (accidentally) discovered his affair with Yoko Ono. To re-experience the glory days of the most influential pop band in history, shop Remembering the Beatles, on newsstands now.